We have a rapidly aging population. In the next few decades the number of Americans age 65 and older will double, from 35 million in the year 2000 to 71.5 million in 2030. 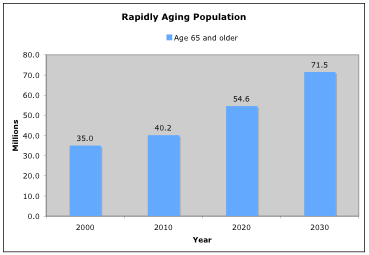 The percentage of Americans age 65 and older will increase from 12% in 2003 to 20% in 2030 (USA Today, Nov 2003). This portion of the population will represent a significant market for exercise programs. It is important to note that the incidence of disabilities among the elderly doubles every 5 years after the age of 65. Sarcopenia is the term for age related muscle loss. Williams Even, Ph.D. and Irwin Rosenberg, M.D. coined the term from the Greek words “sarco”, meaning flesh or body, and “penia”, meaning reduction in amount. Sarcopenia, although age related, is not due to the aging process itself, but to disuse atrophy and becomes self-perpetuating. As we age, we generally become less active and engage in less demanding activities. The reduction in activity results in the loss of strength and muscle mass. This loss of strength and muscle mass makes physical activity and exercise more difficult, leading to a further reduction in muscle tissue. Due to this loss, we become even more sedentary, etc. The cycle continues into a downward spiral. After the age of 30, adults typically lose up to 10 oz. of muscle mass per year, just over 8 lbs. per decade (Evans & Rosenberg, 1991). The rate of loss accelerates after the age of 45. This is due not only to atrophy of exercise muscle fibers, but also to degeneration of spinal motor neurons, usually the type II, fast twitch units (Lexell, 1995, Yamada et al., 2002). It is not uncommon for an adult to lose up to 30% of their muscle cells between the ages of 20 to 70. Sarcopenia is not only a condition of the advanced elderly, but starts between the ages of 20 and 30. The capacity for strength development is impacted to a greater extent with advancing age than the capacity for endurance. Muscle biopsies comparing young and older muscle show a reduction in the percentage of fast twitch (strength based) fibers and an increase in the percentage of slow twitch (endurance) based fibers in older subjects (Hameed et al., 2003, Klitgaard at al., 1990, Nikolic et al., 2001). Hence, it is the author’s opinion that strength based training programs should be emphasized with advancing age. •	Decreased bone density (Kerr et al., 1996). The onset of these degenerative conditions is synonymous to the “domino effect”, starting with the loss of muscle mass and strength. The loss of strength and muscle tissue lead to reduced mobility, followed by a decreased basal metabolic rate, increased body far percentage, decreased metabolic enzymes, decreased insulin sensitivity, and finally a decrease in bone mineral density. To date, the best treatment for sarcopenia is high intensity resistance training. Research consistently shows that high intensity resistance training can improve all of the degenerative conditions associated with age related muscle loss. Earlier research (Moritani & deVries, 1980) showed that resistance training was not an effective method for stimulating in increases in muscle tissue in older subjects. Thus, the authors concluded that strength gains in older subjects were largely due to neurological adaptations. However, this study used a lower resistance / lower intensity (60% 1RM) training protocol, as well as lower resolution methods (anthropometric measurements) to determine hypertrophy. Later research (Frontera et al., 1988, Fiatarone at al. 1990) demonstrated a significant increases in both muscle mass and strength with higher intensity resistance training in older subjects. Both studies used high load / high intensity training (80% 1RM) and higher resolution methods (CT scans and / or muscle biopsies) to determine hypertrophy. Frontera and colleagues demonstrated an average strength increase of 107% in the knee extensors and 226% in the knee flexors in older untrained men (60-72 years) with high intensity resistance training. Significant hypertrophic responses were also demonstrated with CT scans, showing an average increase of 11% in total muscle area of the thigh. Muscle biopsies exhibited an even larger hypertrophic response of approximately 30% in both fibers types tested (Type I and Type II). Fiatarone and colleagues (1990) demonstrated an average increase of 174% in strength of the knee extensors in older subjects with 8 weeks of high intensity resistance training. Mid-thigh muscle area, as determined by CT scans also showed an average increase of 9%. Gait speed, one of the strongest correlating factors with falls among the elderly, also increased of 48%. The significant findings of this study reveal the importance of high intensity strength training with advancing age, as the subjects were frail nursing home residents of 90+ years, the oldest of which was 96. Our personal training program will help delay sarcopenia. Give us a call. Age Data. USA Today. 2003. Campbell WW, Crim MC, Young VR, Evans WJ. Increased energy requirements and changes in body composition with resistance training in older adults. Am J Clin Nutr. 1994 Aug; 60(2): 167-75. Hagerman FC, Walsh SJ, Staron RS, Hikida RS, Gilders RM, Murray TF, Toma K, Ragg KE. Effects of high-intensity resistance training on untrained older men. I. Strength, cardiovascular, and metabolic responses. J Gerontol A Biol Sci Med Sci 2000 Jul;55(7):B336-46. Hameed M, Orrell RW, Cobbold M, Goldspink G, Harridge SD. Expression of IGF-I splice variants in young and old human skeletal muscle after high resistance exercise. J Physiol. 2003 Feb 15;547(Pt 1):247-54. Epub 2002 Dec 20. Hunter GR, Wetzstein CJ, Fields DA, Brown A, Bamman MM. Resistance training increases total energy expenditure and free-living physical activity in older adults. J Appl Physiol. 2000 Sep; 89(3): 977-84. Klitgaard H, Mantoni M, Schiaffino S, Ausoni S, Gorza L, Laurent-Winter C, Schnohr P, Saltin B. Function, morphology and protein expression of ageing skeletal muscle: a cross-sectional study of elderly men with different training backgrounds. Acta Physiol Scand 1990 Sep;140(1):41-54. Klitgaard H, Zhou M, Schiaffino S, Betto R, Salviati G, Saltin B. Ageing alters the myosin heavy chain composition of single fibres from human skeletal muscle. Acta Physiol Scand 1990 Sep;140(1):55-62. Lexell J. Human aging, muscle mass, and fiber type composition. J Gerontol A Biol Sci Med Sci 1995 Nov;50 Spec No:11-6. Martel GF, Hurlbut DE, Lott ME, Lemmer JT, Ivey FM, Roth SM, Rogers MA, Fleg JL, Hurley BF. Strength training normalizes resting blood pressure in 65- to 73-year-old men and women with high normal blood pressure. J Am Geriatr Soc. 1999 Oct;47(10):1215-21. Miller JP, Pratley RE, Goldberg AP, Gordon P, Rubin M, Treuth MS, Ryan AS, Hurley BF. Strength training increases insulin action in healthy 50- to 65-yr-old men. J Appl Physiol. 1994 Sep;77(3):1122-7. Nikolic M, Malnar-Dragojevic D, Bobinac D, Bajek S, Jerkovic R, Soic-Vranic T. Age-related skeletal muscle atrophy in humans: an immunohistochemical and morphometric study. Coll Antropol 2001 Dec;25(2):545-53. Vincent KR, Braith RW, Feldman RA, Kallas HE, Lowenthal DT. Improved cardiorespiratory endurance following 6 months of resistance exercise in elderly men and women. Arch Intern Med. 2002 Mar 25;162(6):673-8. Yamada H, Masuda T, Okada M. Age-related EMG variables during maximum voluntary contraction. Percept Mot Skills 2002 Aug; 95(1):10-4.